You hear a noise in your home...what do you do? You reach for your bedside weapon, that's what. 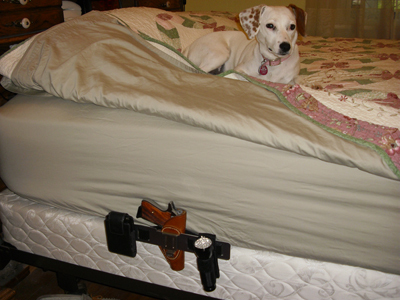 Peace Of Mind At Arms Reach. 8 hole RH / LH Mattress Plate, Wide Platform - made from .100" 5051 aluminum plate. 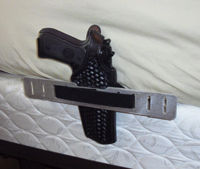 4 hole RH / LH Mattress Plate - made from .100" 5051 aluminum plate. 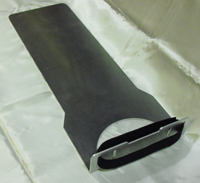 made from .100" 5051 aluminum plate. 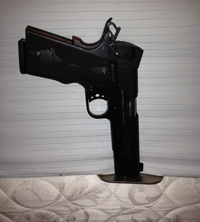 The post are made from a very soft aluminum which will never harm your barrel. Remember that you are squeezing a hard copper jacketed bullet down the throat of your weapon at very high velocity. The aluminum is much softer than the copper and your barrel is very very very hard and can NOT be harmed by this. 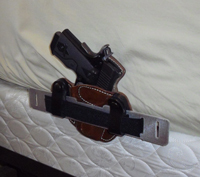 You can mount any holster to the inside, the outside, turn the plate up to raise your holster, turn the plate down to lower your holster, left handed, right handed, it doesn't matter. 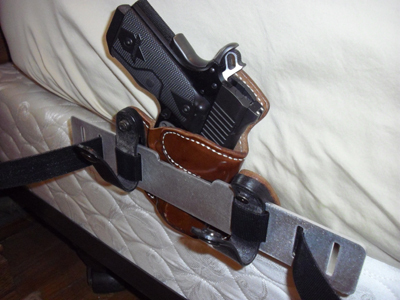 Any rig you can wear on your hip you can mount on our holster and plate units unlike many others on the market today. If you don't have an extra holster, use our plate peg system. 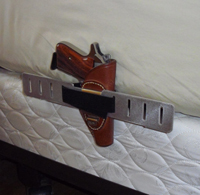 Slip the plate between the mattress and box springs then slip your weapon over the ultra soft aluminum peg. 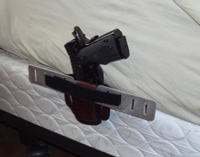 NO, the aluminum peg WILL NOT harm your barrel. Remember, you are squeezing a copper jacketed bullet down your barrel at over 900fps. 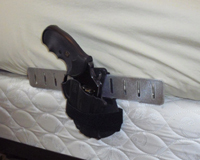 Both the Holster Plate and Peg plate DO NOT need to be removed to change the sheets. 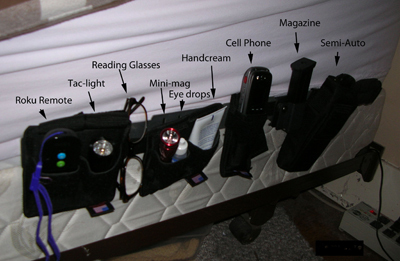 Your bedspread goes over your weapon and is never seen by the casual viewer or burgler. 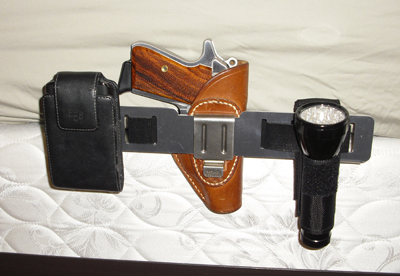 As you can see from the images below, I have tried everything I have and many of my friends holsters too. 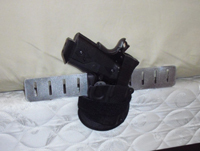 Any holster you can wear on your hip, can be attached by using the supplied 1" double sided High Strength Velcro Belt Strip provided. With the custom cutouts and special frame design, I haven't found a holster that wouldn't fit just right. 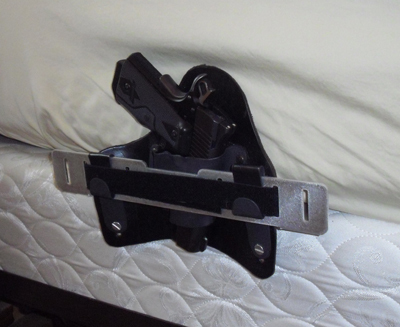 Made from .100" 5051 H-32 aluminum in mill finish, this heavy duty holster system will give you countless years of service and can be used on any bed, with any mattress. (That wasn't very manly, I can't believe I just said that). 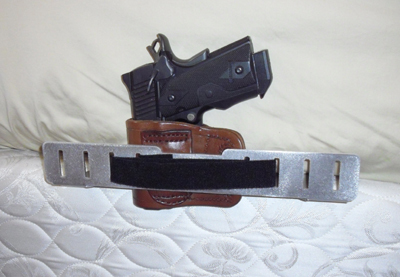 If you want to mount your flashlight, knife, cell phone or anything else that has a belt loop case or clip, I have made the TWS-Bed mounting platform extra wide with extra holes for you to attach those items as well. You can also use our new TWS-P45, TWS-P38 or TWS-P22 Bed plate that allows you to mount your weapon without using a holster. 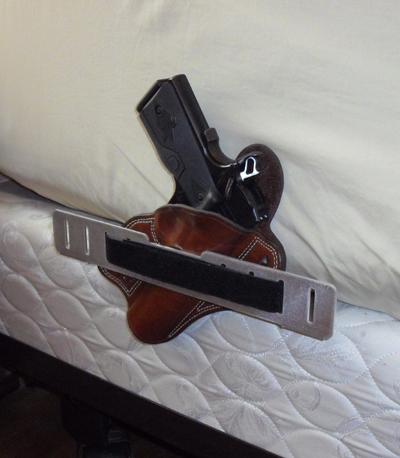 That's right, no holster necessary. Using our unique post system, just slide the barrel right on to the post to store your weapon. 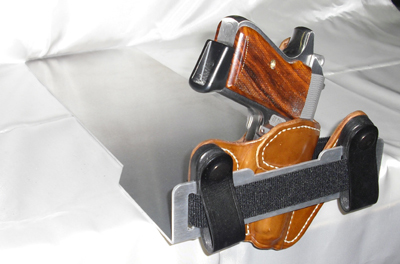 Made from ultra soft 5051 aluminum, your weapons bore is protected from any harm what so ever. 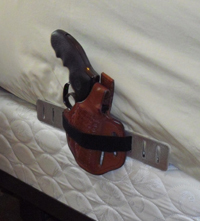 I take one with me on trips and use it in the hotel to keep my weapon at arms reach day or night. 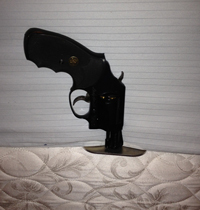 But for you ladies, my wife has her S&W PPK/S at Arms Reach by her side every night and loves it. No more reaching in the side drawer or night stand. 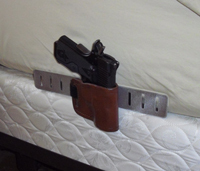 It's undetectable when you pull the bed spread over it too.